Here are the bare minimum pieces that you will need to make your own nitrous system. One thing to keep in mind, this is not a list of parts that allow you to build the system from raw components. if you are interested in that, I suggest you check out John Williamson's page. 1 - set of wire and connectors/electrical tape. 1 - Teflon paste. Do not use the tape! The first thing you will need is a bottle. I would suggest a 10lb(pound) capacity bottle with a pressure gauge attached to the valve assembly. Now you can get a separate gauge that goes to a pillar mount, but you will be spending a little more for that, because you will need an extra 'T' fitting and a couple more pieces of feed line to attach it all together. The other thing to remember is that you only see what the pressure is AFTER you open the nitrous bottle, whereas the one attached to the bottle displays the pressure all of the time. 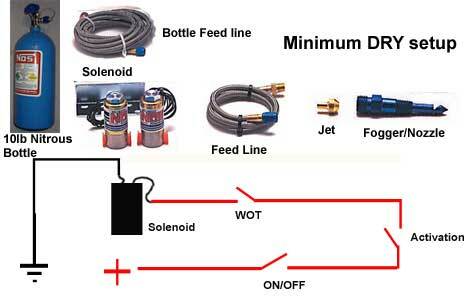 Bottle Feed line- depending on where you mount the Nitrous bottle, you will need 1 - 10-16ft feed line. This line will run from the bottle to the nitrous solinoid. Nitrous Solenoid- pretty abundant-this is the second most expensive part you will buy next to the bottle. Nitrous nozzle and Jet- This nozzle needs to be the DRY type- it will have only one fitting on it. The wet Fogger nozzles have two, one for the nitrous, and one for the fuel. The Jet will fit in between the feed line and the nozzle-this will restrict the amount of nitrous being fed to the engine. Switches and Wire- There are 3 switches in my setup: a WOT(wide open throttle) switch, an activation switch, and an arming switch. the WOT switch is mounted by the throttle body-this takes a little bit of time to fashion the mounting bracket and adjust it just right. the Arming/System switch turns the system "on"
the Activation switch is the button that you push to activate everything--the magic button if you will. Disclaimer- I am not responsible for anything! This is for informational use only, blah blah blah. If you want to sue me, you agree to give me the money first, I will hold it for a minimum of 1 year, then the settlement will equal the exact amount that you originally gave me. This is my price for being sued. Minimum amount is $1,000,000 US.